Victoria Heisey Memorial Learning Support Center Endowment – Touching the lives of students with learning disabilities. Victoria had a special place in her heart for these students and she reached out to them in many ways. Daughter, sister, friend, alumna. Victoria was many things to many people. She was passionate about ensuring no one was teased or treated different for any reason, particularly if they had a disability. Victoria was their friend and champion. Too soon Victoria’s life here on earth was over. 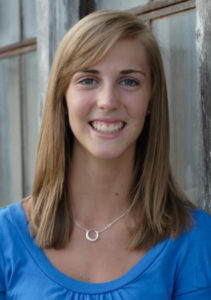 Acute myeloid leukemia took her life, just 54 hours after being diagnosed, at the age of 18 in November 2008. November was the 10th anniversary of Victoria’s passing and we are choosing to celebrate who she was to so many and honor her passion to see each person treated with love and respect. The Victoria Heisey Memorial Learning Support Center Endowment was created in 2008 and today we celebrate that it has assisted families and students with learning disabilities at Lancaster Mennonite High School for the last 10 years. Join us now in bringing awareness to the fund and helping to grow the endowment by remembering Victoria’s life and love for students. Please consider making a gift to her endowment. With each gift of $25 or more you will receive a lovely mug, specially created in honor of Victoria. 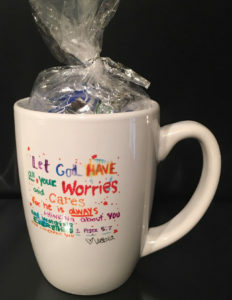 Along with the mug is the story behind the 1 Peter 5:7 artwork created by Victoria in 2006, and her favorite candy to celebrate her life. Please allow approx. 3 weeks for delivery. Click here to make a gift today or send your check payable to LMS, to 2176 Lincoln Highway East, Lancaster, PA 17602. Please note on your gift designation “Victoria Heisey Endowment” and specify the number of mugs you would like (min. $25 gift for each mug). 100% of your contribution will go towards Victoria’s endowment.